The way people are searching online for information is changing, yet again. People are finally using voice to search for information with new electronics such as Amazon Echo, Google Home, or even a phone or tablet. Why finally? Well, voice search isn’t necessarily new. Did you know that voice search was originally introduced in 2009 by Google but required the users to call a phone number from their mobile device and speak their search when prompted? Well, as you can imagine this type of behavior wasn’t quickly adopted until a more user-friendly solution was introduced. With a better solution in place, people’s search habits are changing and SEO professionals need to start thinking differently about their strategy. What can you do now to prepare your website for this change in search behavior? To optimize for voice search, you must understand voice search. According to a trends report for 2016, people are using voice search or assistant apps primarily to find location content and information. If your business is a local business, you should put together a new SEO strategy targeting voice search users and be sure that you have claimed and manager you Google My Business listing and other local business listings. It is also important to understand not only what people are searching for, but how people are now searching. Traditionally people have used keywords to search for information on search engines. 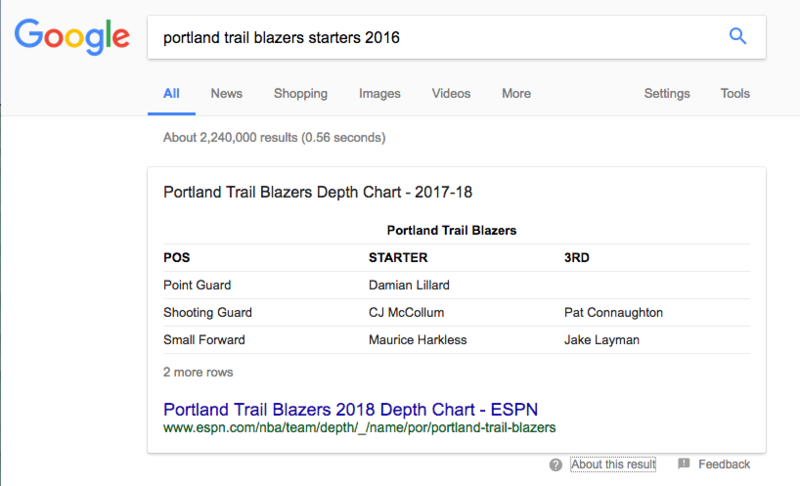 For example, if someone wanted to do a find updates on Portland Trail Blazers trades, they’d probably just search “trail blazers trades”. Voice searchers are using more natural ways of communication and the search terms have evolved to search phrases or long tail keywords. Instead of two or three words, the search phrase may be 6-10 words and something like, “Any updates on trail blazers trades?”. Who is the starting guard for the Portland Trail Blazers? What is the name of the starting Guard for the Portland Trail Blazers? When was starting guard for the Portland Trail Blazers drafted? Where is the starting guard for the Portland Trail Blazers from? Why was the starting guard for the Portland Trail Blazers drafted? How can I become the starting guard for the Portland Trail Blazers? As you can see, the keywords are lost in these searches and they’ve evolved into key phrases. If you want to rank for these types of searches, you must start answering these questions with your content in a natural, non-spammy manner. Your SEO strategy shouldn’t cease at creating conversational content though. 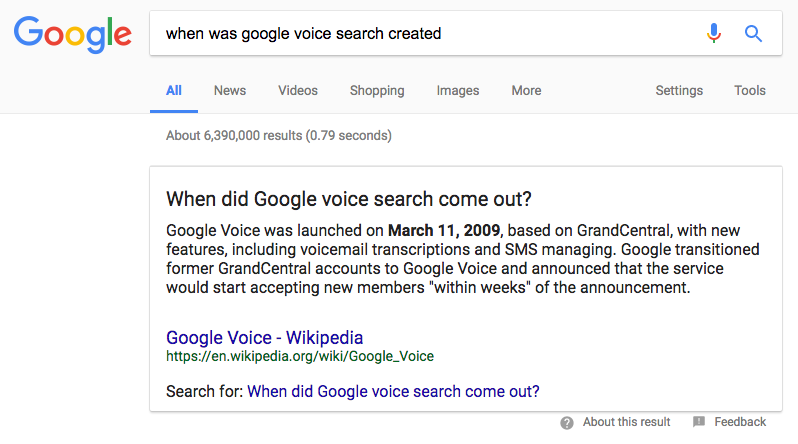 A large component of voice search is how Google is serving up answers on search result pages. Google’s rich snippets or quick answers. Rich snippets were introduced back in 2009 but again, they took some time to catch on. It was in 2011 when schema markup was introduced as a way to help Google’s search crawlers understand content on your page and now SEO professionals have been ranting and raving about it like it is something new. It’s not, it’s just becoming more widely seen with the impact of Google’s Hummingbird update and Voice search coming more popular. Rich snippets allow bits of your content to appear on search result pages for users to quickly find answers to their questions. This is great for the user but the extra hurdle to attract users to their site can make SEO professionals a little upset because it is taking away valuable traffic from their website and reducing the opportunity to teach people about their brand and offerings. But I digress. To have your content appear on search results you must include micro data markup and can learn more about this at schema.org. Now, all of this talk about voice search and we haven’t even mentioned one of the most important factors. Be mobile-friendly. Voice search is most common on mobile devices so be sure your website is mobile-friendly so that the content renders appropriately on mobile-devices and loads fast. If you haven’t done so already, I’d recommend using Google’s Mobile-Friendly Test to see exactly how friendly your website is. Now, it may be possible that voice search hasn’t dominated your industry, but it is coming. According to Hitwise, nearly 60 percent of all searches are mobile now and voice search is becoming a more convenient solution for people to use of typing. In fact, a 2016 trend report shows that voice search is rapidly gaining market share and by 2020, at least 50 percent of all searches are going to be through images or speech. It is time to act now. We hope you enjoyed the post and if you have any questions please reach out to us and we’ll be happy to answer. Also, feel free to share this post with your friends and colleagues.